What does it mean to be in close-proximity to another person? To be of the community and to exist as an individual? What roles do artists play in the reactivation of forgotten spaces, and how do we reclaim these spaces for imagination and play that speaks to our culture and personal contexts? These are some of the questions I think about as I watch Emma Draves and Andrea Cerniglia rehearse developing works for their shared concert, “SNUG,” Feb. 15-16, at 4251 N. Lincoln Ave. The concert—bringing together Cerniglia, the artistic director of Dropshift Dance, and Draves, an independent dance-artist and educator—will be shown in an empty storefront, turned gallery-styled performance setting in which audience members will be able to take advantage of different viewing and seating options during the performance. 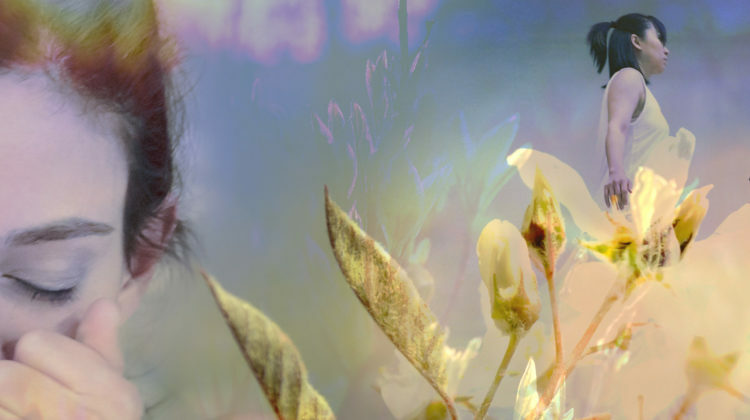 According to a press release, Draves’ work, “The Quiet Hours,” delves into “themes of independence and interdependence, tracking how we comfort ourselves in the ‘quiet hours’ and when we reach out for community;” while Cerniglia’s work, “At Our Edges,” “explores an adaptable physical state and our connection to the natural world and its processes of life and death.” Watching each of the works in rehearsal, I am drawn to the use of suspension, each of the ensembles’ embodiment of gravity, their intentional listening to the body that is both external and internal. Draves and Cerniglia—both with backgrounds in Laban Movement Analysis—encourage their dancers to make choices within a sketch in response to their environment, and in awareness to other bodies in the space that provides a supportive frame for exploration and a sharing of energies for both performer and audience member. 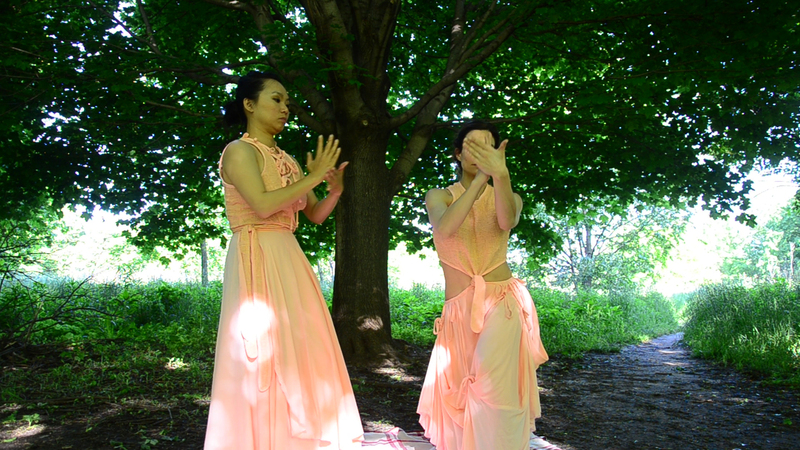 Even though the work will be performed in a non-traditional space, Draves and Cerniglia rehearse with their ensembles in traditional dance studios. However, there is certain level of anticipation and preparation building in each rehearsal for what will happen when the dancers and audience members enter the storefront. This is what excites me about the work: the potential for new things to emerge that may not have surfaced in the studio, the possibility for new variables to be introduced in each lift and jump, the risk of coming in direct contact with an audience member, and the idea of what will happen to the physical space when it is all over—the reverberation, the residue and the memory of what was. Each of these works are smaller iterations of longer works that will premiere later in May. 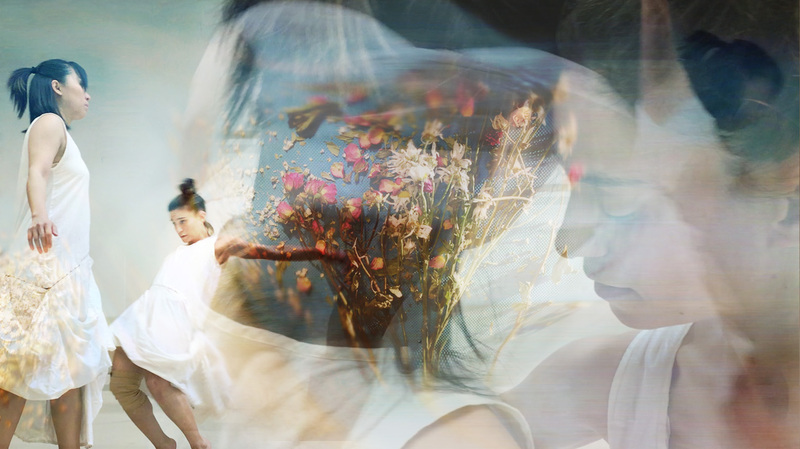 Cerniglia, who is currently working with several collaborators including filmmaker Nadia Oussenko, is excited to bring in community movement as a way “to impact the physicality of viewers…with a sense of weight and breath to impact their [space] as they watch and experience [the dancers],” she says. Draves—whose work is, in a sense, a continuation of her research in her 2018 Set Free residency at Links Hall—is curious to see how she can push the individual within unison moments, using the importance and focus and touch to care for, and see the individual. The luscious moments of surrender to gravity—and to the collective—in each of the works that is lovely to watch. 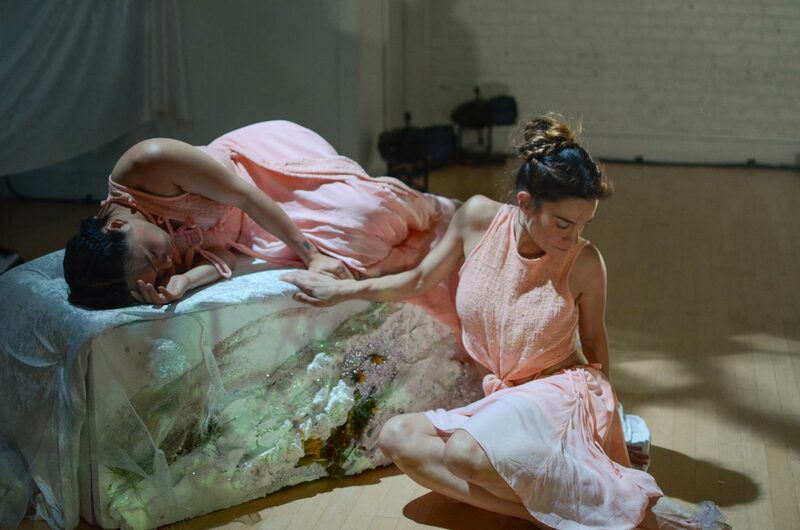 Draves’ sustained and circular movements that extend time, and Cerniglia’s playful energy shifts provide space for organic and human synergies where audience members can feel safe to indulge in the quiet, as well as the visceral moments. “SNUG” runs Feb. 15-16 at 4251 N. Lincoln Ave. Tickets are $12-24, available through the event link below. Humanoid, geometric forms shift against walls, foreshortening the perspective of long, narrow halls. People squeeze between them as they move from one room to the next, temporarily becoming part of the shapes and movement. It’s unsettling and oddly arousing, a satisfying shift in social conventions for how we interact with one another. The fourth in Dropshift Dance’s “Imposters” series, company artistic director Andrea Cerniglia has brought together a range of committed dancers with varying levels of experience, including Cerniglia, Weichiung Chen-Martinez, Jill Moshman and Ali Naranjo. In progress since September 2016, this installment, as with each past edition, is intended to respond site-specifically to the architectural features of the space in which it is performed. Defibrillator presents challenges: no Marley flooring, many raw spaces. “The sprawling nature of the spaces allow for a journey—this is a new and exciting opportunity for my work,” Cerniglia explains. “It continues to question how we consume art by pushing past traditional formats and placing audience members and performers in situations that require thoughtful action and spontaneous choices and responses.” It will be interesting to see what elements of the gallery they choose to engage, not least of which due to Cerniglia’s tendency to have dancers wear large, padded costumes that modify the space within which her dancers operate. The clunky Franken-cushions, originally designed by Amanda Franck and modified with burlap and moss by Collin Bunting, provide yet another layer of architectonic dynamism that, at times, results in direct interactions with members of the audience. Rounding out the collaborative effort, Luke Gullickson provides soundscape design, Nadia Oussenko, video installation, and Richard Norwood, lighting design. Dropshift Dance at Defibrillator Gallery, 1463 West Chicago, $20-$25, (773)609-1137 or dfbrl8r.org. Aug 16-18. FloatBrilliance, premiering this weekend at Links Hall, is the third installment of what Artistic Director Andrea Cerniglia calls the Imposter Series, a multi-year project consuming at least half of her company’s history. 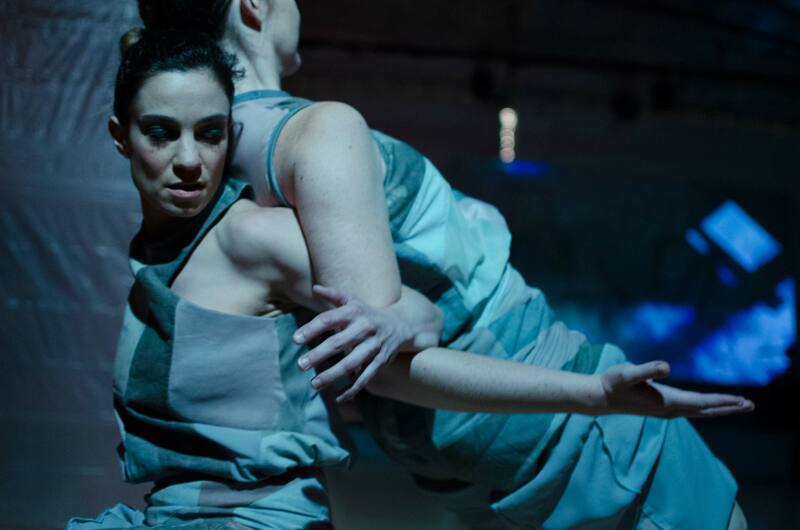 In dropshift dance’s six seasons, Cerniglia’s aesthetic has gently, steadily pulled away from her roots in Zephyr Dance, but her commitment to multiple mediums with equal attention to the sonic, visual, and kinesthetic environments has never wavered. Each of the works in the Imposter Series is a stand-alone entity, with little resemblance to the others. The common thread is all about the audience. When given free reign, what are the choices we make about interacting with performance? Are we willing to get close to it? Are we willing to let it happen around us and be observed by others with our bodies and behaviors becoming a part of work? As with her other works, audience seating is unconventional, but FloatBrilliance imposes a few more guidelines. Guides will gently encourage audience members to sit very close to the performers at the start, though it feels less and less possible to remain close as the piece evolves. Compared to the others in the Imposter Series, FloatBrilliance is “softer and rounder,” said Cerniglia, but it’s also decidedly dancier with sweeping passes of physicality that will likely push audience members to the perimeters of the space. 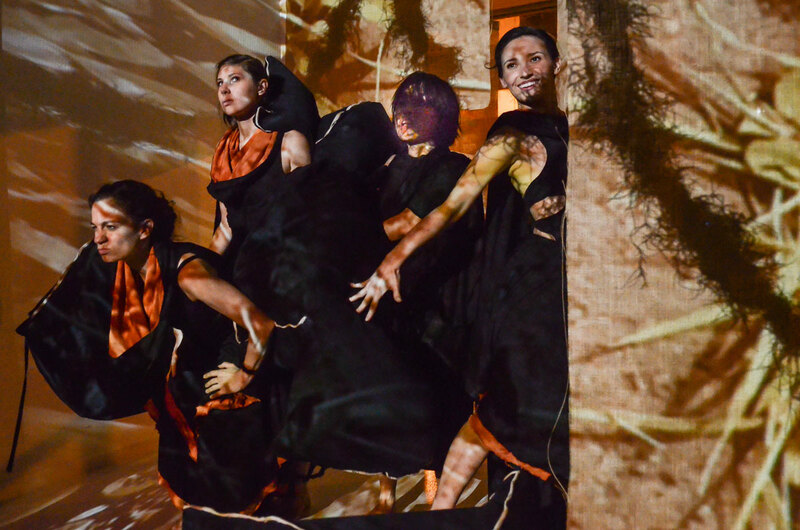 References to nature abound, in the mossy knoll on which the four women in the piece both perch at attention and lounge, and complementary projection designs by Rosa Gaia and Jeremiah Jones. But this and the other elements — Cerniglia’s soft and round movement vocabulary, the underlying hum of composers Elliot Cless and Luke Gullickson’s score layered with conventional instrumentation and subtle electronica, and Collin Bunting’s flowing, blush colored costumes — allude more to the feminine mystique (or to Mother Nature herself?) than toward any sort of direct comment on trees and grass and butterflies. The eyes are often closed; when they open the women are coy, demure, at times skeptical. 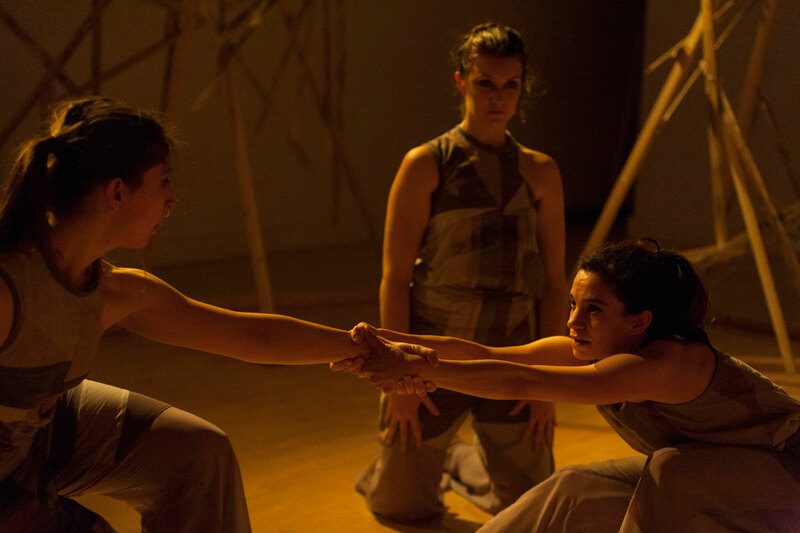 What arises from the dance is the sense that these four women (Cerniglia performs with Colleen Welch, Weichiung Chen-Martinez and Jill Moshman) support and console one another as sisters, but (like sisters) also question and challenge each other. Kind of like Cerniglia’s audience experiments, with agency comes accountability. FloatBrilliance premieres June 17-19 at Links Hall, 3111 N. Western Ave. All performances are at 7:00 pm. Tickets are $20-25, available at the door or online. Audience format is fluid, however persons with disabilities or impaired mobility will be accommodated. You almost feel you’ve stumbled into a bridal situation, with yards of tulle draped here and there, flowers littering the perimeter of the space, many glittery surfaces, and four nymph/bridesmaids in long peach gowns, seated or lying in graceful repose, waiting. 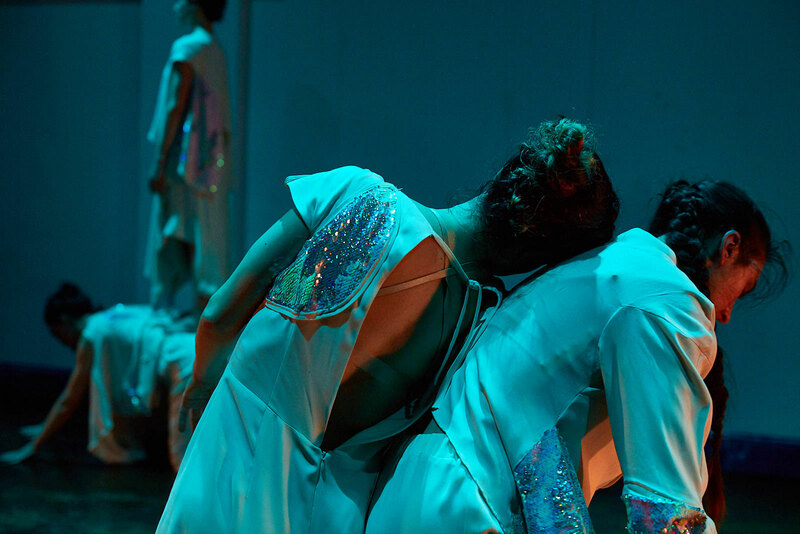 Beauty marks Dropshift Dance’s new “FloatBrilliance,” which closes Sunday at Links Hall, beauty in the design and in the dancing. Gentle, patient, searching, it starts in psychology, in the wholeness of an individual or of a relationship, but veers into philosophy, embodying the principles of action and reaction, control and its loss, affection and antagonism. Consistently divided into duets, it suggests symbiotic relationships — which can be beneficial or destructive, and sometimes both at once. Live and recorded ambient music by Elliot Cless and Luke Gullickson creates a sonic wash of various intensities and allusions: Though strings and piano can sometimes be heard, so can electronic simulations of what seems like a jet taking off and the sounds of water — rain, a wave crashing. Projections of a sunrise or sunset, of lightning flickering in darkness, of a watery surface dotted with boats appear now and again on a billowy, sparkly curtain. At least, I think that’s what these images were. The audience was seated on cushions arrayed around three sides of the space, and I was at the far end of one side, very near but almost behind the settee/bed/altar that was the set’s focal point. As directed by Andrea Cerniglia, the fluid, integrated movement of “FloatBrilliance” intentionally blurs the line between volition and passivity. For many minutes early on, Jill Moshman and Colleen Welch sit side by side facing into a corner, their drooping heads relaxed together; from a perspective far behind them, a footlight burning into their faces created a glow. A slight motion, perceptibly initiated by neither, eventually turns into rocking, a pendulum. Meanwhile the focus is on Cerniglia and Weichiung Chen-Martinez, who form a riveting relationship with each other and, rarely, with the audience. Intimacy, trust, care — each closes her eyes at points to be manipulated by the other — come across most forcefully, but there’s also something impersonal, even antagonistic, about their interactions. As Cerniglia repeats the motion of crooking an elbow and flicking a hand, Chen-Martinez watches like a cat about to pounce, aiming to interfere with or control the movement. About midway through “FloatBrilliance,” Moshman and Welch begin their more kinetic but less intense duet; it’s as if all the movement dissipated feeling. At this point my attention began to flag, except during an almost comical musical-chairs sequence on the settee for all four dancers, with gestures traveling from one to another person: gazing into a palm as if into a mirror, fists brought to the mouth in mock horror. “FloatBrilliance” is exceptionally well made, knitting together all the symbiotic nuances of relationship, whether between two people or between parts of the self. But it begins to feel airless, even claustrophobic. Like a 19th century, well-made play, it is a closed system. Actions become predictable; the long, slow, inevitable finale, which brings the work full circle, is a slog. It doesn’t help that the audience is asked to sit on the floor for nearly an hour and a half. That would detract from anyone’s experience, anytime. Where: Links Hall, 3111 N. Western Ave.
Freelance contributor Laura Molzahn has written about dance for 25 years at publications including the Chicago Tribune, Dance Magazine and the Chicago Reader. A native Minnesotan, she attended Carleton College, UIC and Northwestern University, where she earned a doctorate in English. She tells herself she likes the challenge of verbalizing nonverbal art forms. FloatBrilliance at Links Hall, 3111 North Western, (773)281-0824. Friday-Sunday, June 17-19 at 7pm. $20-$25. Tickets at linkshall.ticketfly.com/event/1134369-dropshift-dance-chicago. In her fifth season as an Artistic Director, Andrea Cerniglia continues to “go big or go home.” As a 21st Century Diaghilev of sorts, Cerniglia has called on some of the best collaborators in the business for the creation of Imposter/Contained, continuing a series that began last year with Imposter/Malleable. As with the first, this Imposter is an immersive installation full of eye candy. The audience is given instructions to wander and move about the space as we wish, choosing our vantage point within the three-dimensional dance space. We must make decisions about where to stand and, once we decide, what to look at, because things are happening all around us. The choices we make have a direct influence on what we experience and how we interact with the work, or don’t. As the evening progresses, the impact of our decisions as viewers became quite clear. Coming into a dropshift show is a bit like entering a museum. We wander and pause, wander and pause, sip our drinks and then wander some more. Three women are strewn about the room (Cerniglia, Colleen Welch, and Julie Brannen) surrounded by an intricate set and video installation by Rosa Gaia Saunders and Jeremiah Jones. On the risers of Links Hall’s white space are two projection surfaces on easels, and the fourth performer, Weichiung Chen, with heavy black makeup and a gorgeous, ruffled, low-backed gown. Per usual, Cerniglia has created a quartet of women, however Chen never leaves her post. She is a dance within a dance that, even by the end, does not interact with anything or anyone else. When I took the time to gaze at her and away from the trio, it was all loveliness and intrigue, but did little to enhance the work as a whole. In the main performance area, Saunders and Jones’ seemingly unstable wooden jungle gym is embedded with triangular projection screens. Christopher Fisher-Lochhead’s piano score is played from within a translucent triangular room built into the space. The environment is a balance of natural and unnatural materials, warms and cools, beautifully complimented by Richard Norwood’s lighting and Collin Bunting’s exquisite costumes – a patchwork of alternating stiff and soft fabrics in gray and mauve tones. It is a perfect blend of mediums, however Cerniglia’s desire to create cross-disciplinary, multi-media work doesn’t distract from the fact that dance is her home. Unlike performance artists who incorporate movement into their work, Cerniglia’s work clearly rises out of dance. Her dancers are crisp, clean, and technically sound (Welch and Brannen have never looked stronger). Cerniglia is really good at waiting. Waiting to start, waiting to finish the idea, finding the right spot to change, move, arc, etc. This Imposter is less playful than the last; the score and the dance are screaming for a major chord so we can feel some sort of resolution. The performance simply fades out – the performers didn’t even emerge for a bow. It’s a resolution we never get, and maybe that’s the point. Though the work has moments of levity to break up the ominous tone, one wonders if these moments are provided by us, the audience, and vary from night to night. I mentioned that our choices mattered, and on this particular evening (Friday), the dancers found themselves sandwiched between audience members for a particularly cheeky section of gestures. Coincidentally, Cerniglia was squeezed in between her former Zephyr Dance coworkers Michelle Kranicke and Anne Kasdorf, who both gazed up at her with coquettish smiles. They are perhaps the only two audience members who might have been willing to live in that uncomfortable space for so long; others ran for the hills when they saw the dancers approaching. This gestural section dissolved into an intentional, contagious case of the giggles as the dance descended toward its end. I have no idea what Imposter/Contained is about. It feels neither deceitful nor contained. It is beautiful and frustrating. I loved it, but I can’t identify why. Imagine you’re wandering around an art gallery—and all the art is moving too: changing places around the room, shifting composition within works. At times you feel you’re the one hanging on the wall, and the art is looking at you. 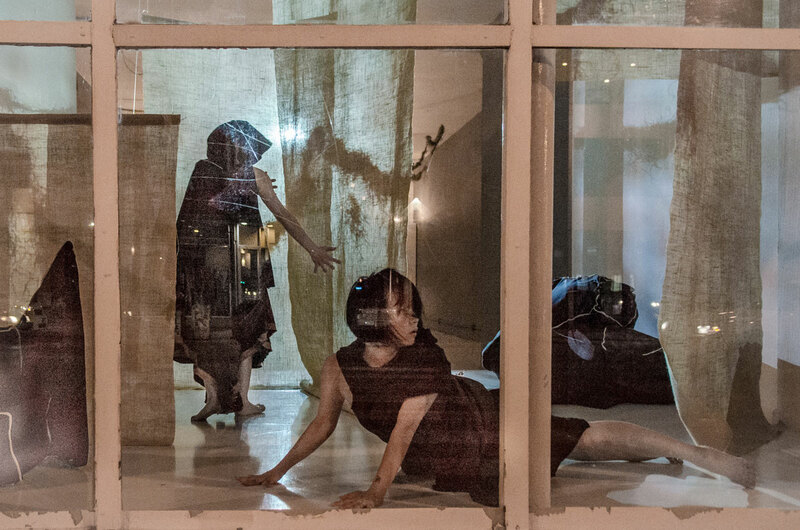 That’s something like the experience of viewing Dropshift Dance’s ingenious, immersive “Imposter/Contained” (third in a series), running at Links Hall through Sunday in celebration of Dropshift’s fifth anniversary. But director Andrea Cerniglia’s point seems to be that artistic containers of all kinds are artificial, limiting. Unlike the trapped Lady Macbeth, the other three dancers (Cerniglia, Julie Brannen and Colleen Welch) are free to roam the space. So are we: Audiences can roam at will, or sit. That means we become part of the performance—and often these accidental additions are among the work’s most beautiful moments: the man sharing the spotlight with Lady Macbeth, watching her; the tall woman peering up into the forest canopy of splintered wooden sculptures. Fisher-Lochhead’s repetitive yet varied music—it can sound like a march, meandering cool jazz, a tragic symphony—provides most of the structure, introducing new sections and moods. The movement alternates between poised stillness and frenetic momentum, between effort and collapse, as the dancers come increasingly into relationship with one another, and with us. One after the other, the three dancers slammed into the wall I leaned against, inches away. Or danced, arrayed front to back at varying distances from my face: A foot away, four feet away, 10 feet away, they made for a dizzying perspective, as if I’d been dropped into a photograph. Such moments thrill, but the constant energy required to try and get our theatrical bearings can be wearing, while all the existential wandering contributes to a lack of direction and sense of purpose. Though power structures, the ostensible subject, can sometimes be glimpsed in the dancing or sensed in the topsy-turvy audience-performer relationship, ultimately no particular point of view emerges.